Slip on this pair of ultra-comfy boots and your feet will be forever thankful. 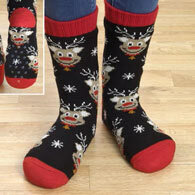 The knitted snowflake patterns on black with red highlights will be the envy of your friends and family. Includes memory foam insole with a textured no-slip rubber bottoms. Mid calf fit, made of polyester knit with a fleece plush lining to keep you warm and comfortable. Hand wash in cold water and lay flat to dry. Boots come in Small (fits women's shoe sizes 6-7), Medium (fits women's shoe sizes 8-9), or Large (fits women's shoe sizes 10-11). Specify size when ordering.